A year ago, every time the neighbors shaggy white dog Feather would appear at the margins of our property, Gandy would bristle and charge and invariably run Feather back across enemy lines. 1) Feather comes and goes as she pleases but Gandy agrees to remain close enough to home to hear us calling, and NEVER goes to visit at Feather’s house. 2) Feather will arrive not later than 8:00 a.m. (adjusted earlier as the days get longer) and will obediently “go home” upon the command, although if it is too early of an afternoon, she did not sign the agreement to stay home. 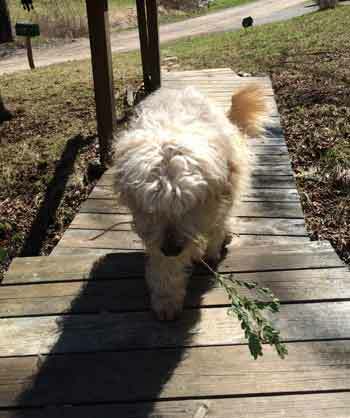 3) Each new greeting (upon a human arriving home in a car or upon exiting the back door for any reason) will result in a token offering of any kind (stick, rock, leaf) as act of appeasement. Yesterday’s offering as I crossed the footbridge fresh home from town struck me as Feather’s Olive Branch of peace. It is a fragment from a privet bush. I came in and put up groceries, only to come to back door and see that I had failed to adequately accept the dog’s symbolic indication of her peaceful intentions on our household and our resident dog. The latter was let out the door, promptly to begin the mock-combat they so dearly love, to heck with Feather’s silly gift. I retrieved the Olive branch to a safe place indoors. It was the diplomatic thing to do. And even as we speak, four thrashing dog paws are stripping away any remaining grass that once grew in what once was a yard before it became a Saturday Nite Wrastlin’ Rink. Fred, I love your storytelling style! 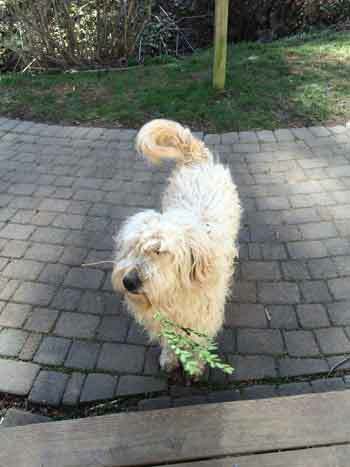 I love shaggy dogs, and I loved your shaggy dog story!